Physicians, Photographers, Filmmakers and Writers Welcome! 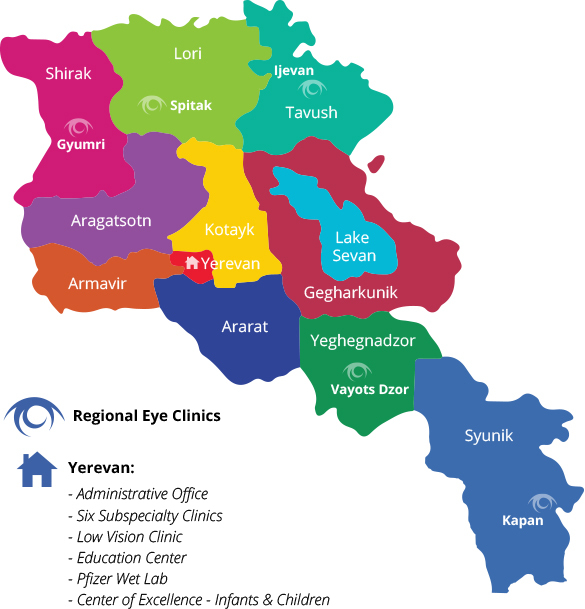 The Armenian EyeCare Project has been traveling to Armenia on twice-yearly medical missions since 1992 — over 50 missions to date! They are typically held in June/July and in September/October. If you would like to join an EyeCare Project Medical Mission, please contact us. Leading the Missions is AECP President and Founder Dr. Roger Ohanesian. He is typically joined by anywhere from six to 12 ophthalmologists of various sub-specialties. The doctors are also often accompanied by volunteer photographers and filmmakers who chronicle the mission. When the doctors arrive in Armenia, their days and nights are already booked tight. Prior to arrival, the Project’s Yerevan office schedules meetings, events and visits to out-of-town schools, clinics and other organizations. The U.S. doctors are in great demand by patients, physicians and country officials and they do not have a free minute to spare. While in Armenia, doctors work alongside the Armenian physicians and teach at all of the Project’s facilities, which include the Mobile Eye Hospital; six specialty clinics — Glaucoma, Retina, Corneal-Uveitis, Neuro-Orbital, Pediatrics and Low Vision Clinic; a state-of-the-art Education Center with a “Wet Lab” donated by Pfizer; and a Diagnostic Center. In addition, the doctors visit schools, nursing homes, soup kitchens and polyclinics — anywhere and everywhere they are needed. The EyeCare physicians who visit are just as excited, looking forward to the cases that the residents and fellows present to them and the opportunity for the peer-to-peer exchange on the most recent diagnostic and surgical techniques. Very eager to see the U.S. doctors are the patients. Once word gets out that the AECP doctors are in town, Armenian residents come in large numbers to line up for appointments. People often wait for hours — sometimes days — hoping to be seen. Cases are identified by the AECP Fellows (Armenian ophthalmologists trained in the U.S. by the Project) for the American doctors to see while in-country and pre-registered for examinations. Very often on these missions, U.S. ophthalmologists bring over exciting new techniques to teach the Armenian physicians, giving them the opportunity to work with and learn from the best. 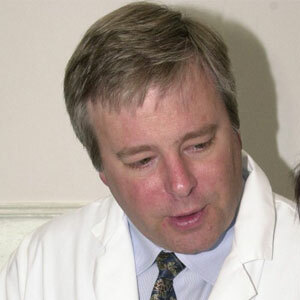 In 2005, Dr. Anthony Aldave, Director of the UCLA Cornea & External Disease Fellowship Program, joined an AECP Medical Mission and performed the first artificial cornea implant surgery in Armenia. On the Project’s 26th Medical Mission, in June 2005, Dr. Anthony Aldave followed with the country’s first artificial cornea implant. Internationally known with awards and honors too numerous to mention, Dr. Aldave serves as Director of the UCLA Cornea & External Disease Fellowship Program as well as the Director of the Jules Stein Eye Institute Eye Bank. The new procedure — Keratoprosthesis Surgery — can restore sight and change lives for patients who are blind from Cataracts and for whom the standard Cornea surgeries are unsuccessful. 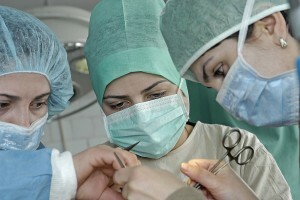 On the last Mission, John Hovanesian and Anna Hovakimyan did a number of these artificial cornea surgeries with this technique and the artificial corneas that Dr. Aldave donated. There are very few events that will change an individual’s life as profoundly as restoring their sight. And that’s what the AECP medical teams do — together with the Armenian physicians — they bring sight to Armenian eyes and they change lives. And because of over 20 years of superior medical education and training provided by the EyeCare Project — in Armenia and in the U.S .— sight is restored every day by the Armenian physicians on the Mobile Eye Hospital and by AECP fellows at the Malayan Ophthalmological Center. Missions are typically held in June/July and in September/October. If you would like to join an EyeCare Project Medical Mission as a physician please E-mail us at Leslie@eyecareproject.com with a letter of introduction. Attach your resume and a one-page statement on why you would like to join us on an Ophthalmology Medical Mission to Armenia. If you would like to join the mission as a photographer, filmmaker or writer, please respond to the same E-mail address, attach your resume and include a one-page statement on how you could chronicle the mission for us. We look forward to hearing from you.